tasks associated in a move, you’ll also have to make the most of the space in your apartment. ​Expect that you won’t have the luxury of space once you move to a small scale apartment. How large your bedroom is in your current house might not be the same when you move to your new apartment. Because of this, you’ll have to sort out all of your valuables and determine which items need to go. You should assess all of your furniture, clothes and everything in between. For any item which you no longer wear or use, decide if you’re going to give or sell these. Keep in mind that you don’t want to bring anything which will only take up valuable space and collect dust in your apartment. 2. Think about your top three priorities. Different people want different things in their own personal space. Some might want their apartment to become their private sanctuary while others want the area to inspire them to do more arts. Depending on your priorities, see to it that your apartment is designed and well-equipped for that purpose. For example, if you’re eyeing to write, relax and mingle in your small scale apartment, make sure that you have a desk and sofa in your apartment. Setting your priorities will make it easy for you to determine which items to bring and which ones to dispose. 3.​Take inventory of the things you’re going to bring. Just because you’re bringing fewer items with you, doesn’t mean that you can memorize all of these. The same is especially true once moving day arrives. You can keep track of your valuables faster and easier when you have an inventory. This should contain a list of things you brought in your small scale apartment. If possible, include pictures, as well. When you know what you actually brought in the new space, you’ll know what to look for. It’ll be more convenient to check whether some of your valuables are missing or damaged especially when you’ve hired movers from NYC. 4.​Prepare a lot of storage options. 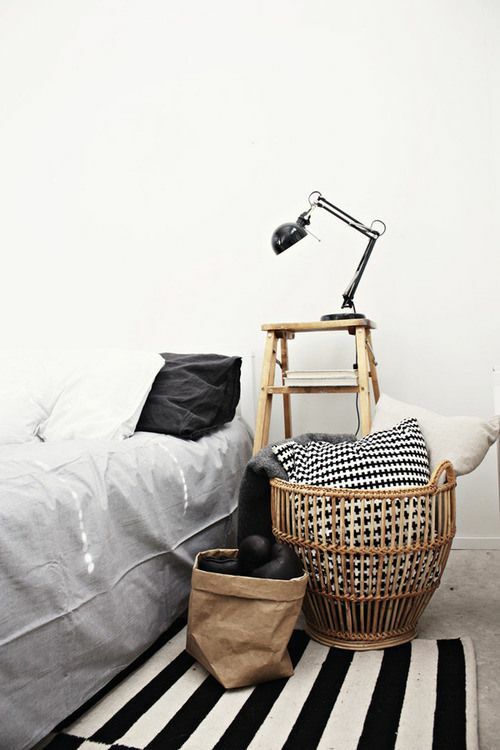 Creative storage ideas can do wonders when you move to a small scale apartment. 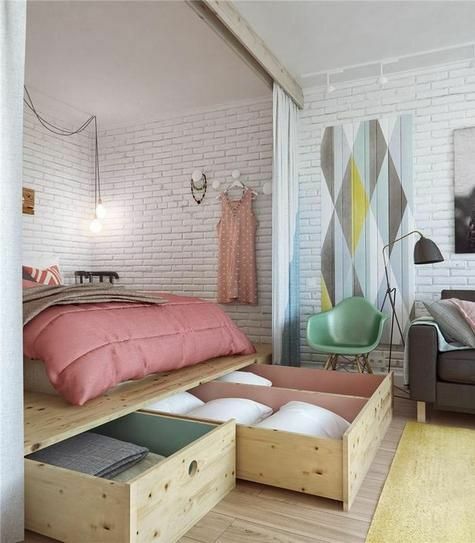 With the right storage strategies, you’ll be able to bring a lot of things with you without compromising the aesthetics and space in your apartment. The internet can provide countless storage ideas so do your own homework and use ones which suit your preferences and needs. Most of these storage ideas are cheap and very easy to make. Organization should never be taken for granted when you move to a small scale apartment. Since you have limited space, you need to pay attention to the things which enter your space and how these are stored. If you’re unorganized, it won’t be long before your apartment will be cramped up and everyone won’t have enough space to move around. This is something which you don’t want to happen, right? From the moment you arrive in your apartment, organize all of your valuables and make sure that everyone in the family does the same. Organization should be maintained at all times so you can make out the best from your space. You can never disregard the tasks associated in a move. Regardless of where you’re from or where you’re heading, you’re expected to comply to de-clutter your home, work with credible movers, pack all of your valuables and rearrange these the moment you arrive in your new home. Aside from successfully accomplishing all of these tasks, also consider the space you’re moving into. This is one factor which you should be keen about as this can play a role in the success of your move. Do you ever tend to flock towards a certain type of style. Maybe you always fall in admiration with a long sleeve red dress, or those bright colored tennis shoes, or even the champaign colored cars. Well, for me it's wood in a home or office space. It looks clean, organic, it's easy to work with and walk on, and most importantly a timeless material for design. As an Interior Designer I am always on the lookout for the subtle changes in design trends, that may lead into something big and truly beautiful. Recently the look I've been seeing, more and more, is wood (on floors, with cabinets, as countertops, chairs...etc), with black and white pairs (used as furniture, decor, backsplashes...etc). So today I bring to you some images, that I love, of this classic trend. Is this trend something you love, something that you could use, or maybe it's something that inspires your for your next DIY project? Always keep in mind, if you need help with your next black, white and wood DIY project be sure to contact me, I would love to help beautify your space! At our house, my husband and I are consistently having guests over, because we love it! We love having people, that we love, in our home. The spirits are high, everyone gets a chance to get to know each other a little better, and you get to share a slice of what your home life may be on a regular day (no matter how crazy that may be). However, there is a major turn-off to having guests over, and that's preparing your house to look guest worthy, a.k.a. clean. Over the past two years, my husband and I have lived in a small 700 square foot apartment, one bedroom and one bath (luckily it's a mostly open floor plan). So, I have acquired some tools and furniture pieces that help me easily store, hide, and prepare slowly for my guests. Ideally, I have a mostly clean house over the week, and I just have to run around the house like a mad woman for about a half hour to find the little things I'd been putting off. Quick or Easy to Find Munchies (For Breakfast, and snacks). To prepare for your guests think EYES and FEET. You look with your eyes (obviously) and you walk with your feet...no brainer right? This is the key to "fooling" your guests into believing you always have an extremely clean home. Clean what you walk on, and clean what you first see (or what's at eye level). Use the bins to your advantage while doing this! FEET. 5-15 minutes. Start off by clearing the floor of any major objects, like children's toys, towels..etc. Then sweep your floor. (Depending on your house size this should only take you this long). FEET. 1-5 minutes. Move shoes into a bin, organize them into a corner, or store them in a closet. FEET. 1-5 minutes. Have a "designated" space for their shoes. If you don't your guests will have their stuff anywhere that looks natural to them. A shoe rack, or shoe bin where other shoes are clearly seen is a good indicator of where they need to put their stuff. If you don't already have a way to store shoes, IKEA has a great and contemporary way to arrange them. EYES. 5-10 minutes. Clear the countertops. Depending on how clean you normally are, this could take some time. I put books, notepads, pens and misc. papers into a bin, laptops on my desk, pans under the oven, and food in the cabinets. EYES. 1-5 minutes. After the counter is clear, make sure it's clean. A Clorox wipe, or a spray and a small washcloth will do. Quickly run your hand over the countertop, and wha-lah! EYES. 0-5 minutes. 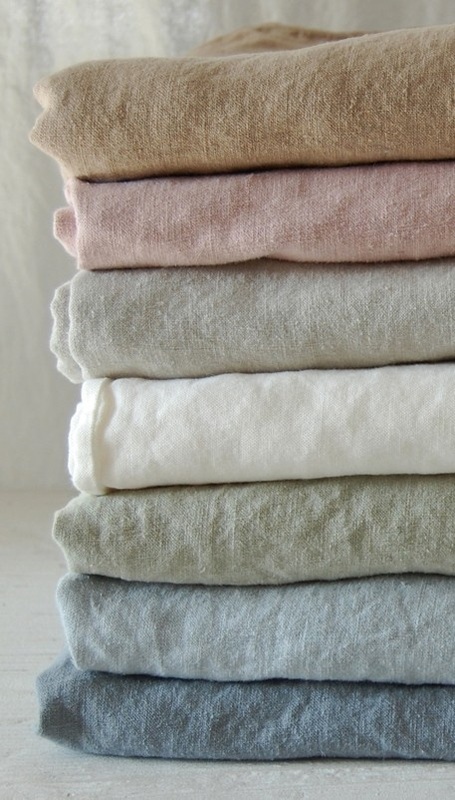 Sheets should already be on the bed, or displayed nicely on the bed, along with your spare pillows, and your spare house key. 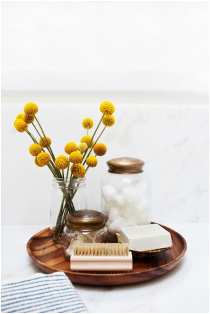 Once your guests arrive, explain where everything they may need to know is located (toiletries, towels, food...etc). Enjoy your time with your guests. 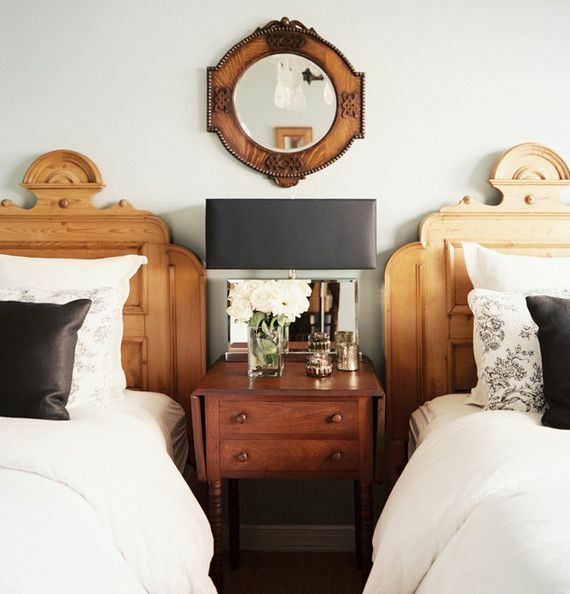 If you have a guest bedroom, you can take extra measures by checking off this checklist to ensure your visitors thrive in your home. When it comes to our living spaces, we want everything to look fabulous. We want our spaces to function like a charm for our families, to be spill/stain/child resistant, and for our furniture to look like a million bucks. When it comes to Interior Design your clients tend to express their desire for a space that wows their friends, but that also reflects their lifestyle. I am here to tell you that both can be achieved. The living room chair needs multiple qualities to ensure it is inviting for guests to sit in, for a fabric that looks clean and is likewise easy to do so, and finally a chair that reflects your style. Listed below are a few points of interest you should keep in mind when it comes to picking our your perfect living room chair. If you want something that truly wows your guests, it won't be something you have seen ten times over on popular design blogs, magazines, and DIY projects. Pick a fabric that colors "speak" to you, colors that compliments (NOT matches) your wallpaper, decorations, and already in-use furniture. 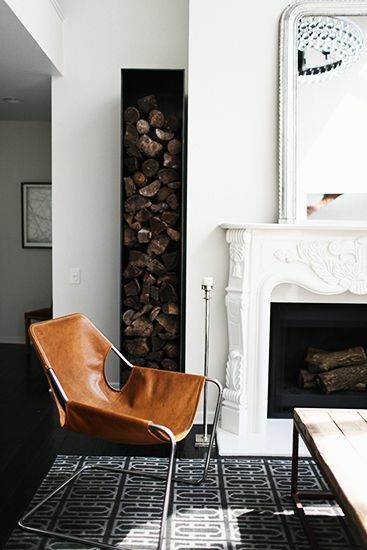 Chairs can be powerful exactly because they’re different than the other furniture in your home. 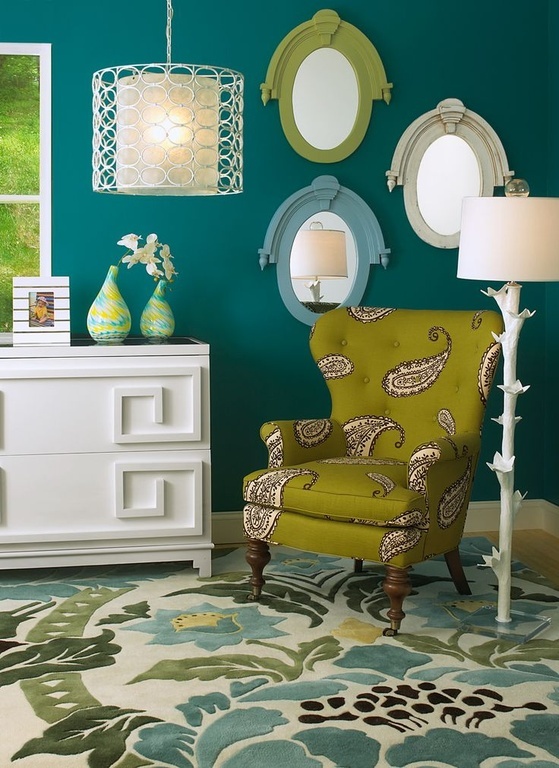 Consider a unique pattern or a strong accent color. 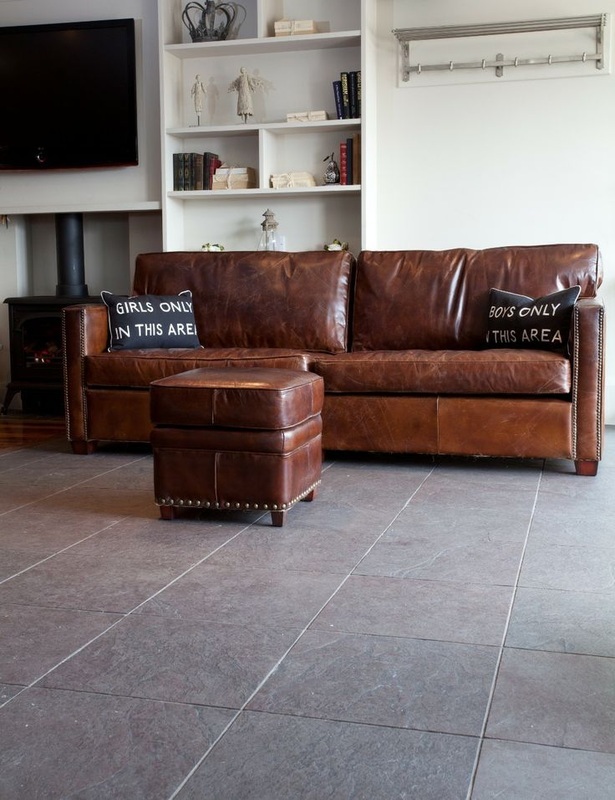 Leather may also be a nice alternative for some homes, whereas sometimes fabric works best. A chair gives you a chance to add seating to your living room as well as a unique furnishing. Your furniture tends to be a big investment, so buying well-made pieces (pieces you feel safe with putting your body weight on the arms..) and classic silhouettes that won't go out of style is key. The construction is important: look for lasting details like solid wood frames and sinuous steel springs. Some people like to search flea markets and thrift shops to find rustic and inexpensive home elements. The construction of the chair is critical to its success in your home. Although you may find a steal with a flea market chair that looks antique, it’s impossible to see the interior of the chair – whether it’s made of hardwood inside or is poorly stapled together. If you found the bones of a chair you absolutely love, strip it down: replace the stuffing and most certainly the fabric. The last thing you want to discover is bed-bugs or unpleasant stains on your recent investment. It needs to be comfortable. I don't care how lovely that expensive looking chair looks. If it isn't comfortable no one will want to sit in it. So sit in the chair (they're on display to be abused), sprawl out, sit comfortably, formally, like you are about to fall asleep, and how you would if you were going to read a book for a few hours. It is important that as well as being comfortable that you can also easily get up from the chair. For example, when people sit on the seat, they should feel the backrest on their back and the seat under their thighs. A seat that’s too deep will put unnecessary pressure on the rear of their knees, potentially creating orthopedic or nerve damage. A shallow seat can cause other problems, mainly discomfort and bad posture. Chairs can survive wine attacks due to a treatment with a stain-resistant fabric finish called a fluorochemical, which most stores urge customers to buy for an extra $30 to $100, depending on the size of the piece of furniture. Want to learn about fluorochemical more click here. If adding a finish is too expensive for you, try looking for a fabric pre-treated with Crypton, buying a leather or thick vinyl will also work beautifully for stains. The Kitchen is widely known as the heart of the home, and because of this we love to show it off. Whether it be with fancy cabinets, expensive stone countertops or beautiful lighting. 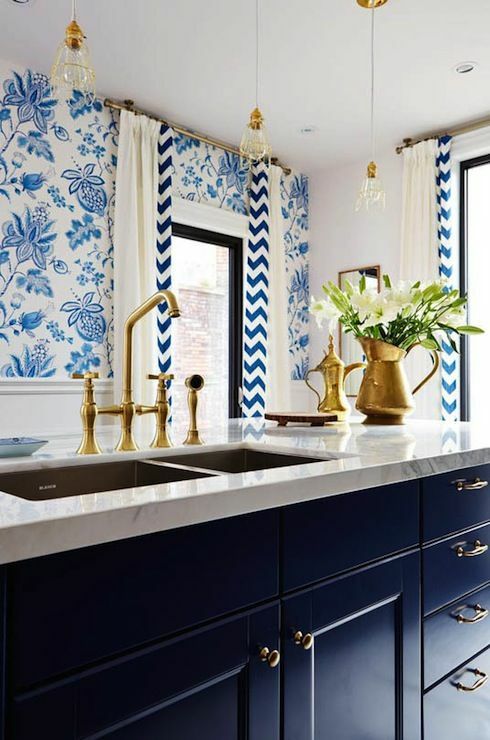 In case you are in a bind with trying to figure out what to do with your kitchen, listed below are just a few trends you can expect to find in 2015. When I first see monolithic stone backsplashes like the one you see to your left I think expensive - prohibitively so, but I still can't help but pore over them as if a mason were standing by waiting for me to decide on one for my own kitchen. Natural beauty of stone is allowed to shine with the running veins, making this one of the biggest statements in your kitchen. Cabinets and drawers now conceal custom features such as: tall silverware holders, pullout doors attached to shelves for pots and pans, holders for recycling and garbage bins, and racks for canned and dry goods. Inserts are often customizable and help to maintain a clutter-free kitchen. By now you have seen the IKEA hacks, cheap apartment fixes and other trends, so more than likely as you walk into newer homes or recent remodels you will see these approaches in their kitchen. Hand dipped entry tables and chairs, seen left is hand painted gold tips to an island. Polish this look off with gold appliances and fixtures. Raising an island on legs or including intricate paneling with contrasting top and sides are ways of turning counters and islands into a piece you'll be proud of. Color is wonderful, except when it can be too bright for certain personality types. If you are not too set on a colorful or an all-white kitchen, then look to the other end of the spectrum and consider choosing black as the dominate tone in your culinary zone. 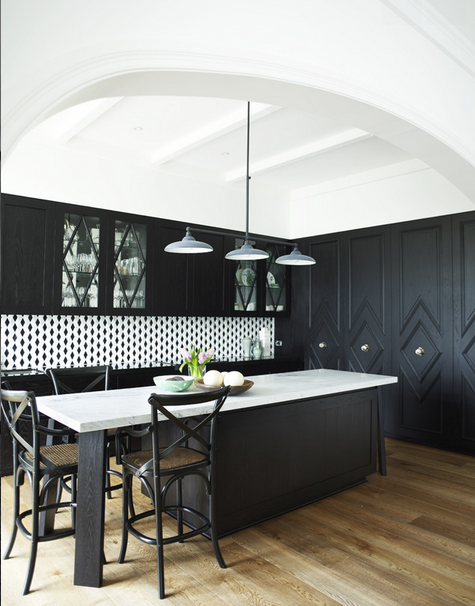 Black makes a strong sleek statement, and black doors seem to fade making any accessories, backsplashes/wallpapers, and lighting extremely important during selection time. To add extra visual interest to your black cabinets try infusing the space with cabinet paneling. A major trend is seeing a move away from geometric patterns and toward warm, elegant, repetitive motifs instead. Which will take shape in wall coverings, barstool fabric, stained glass cabinetry or large print backsplashes. 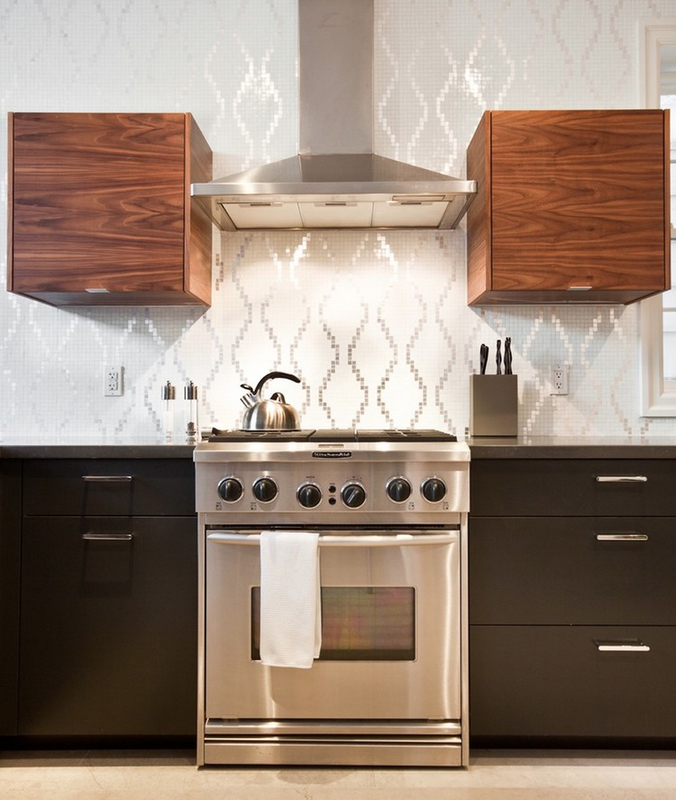 If you like geometric patterns try using warm wood cabinets for a warm flush against simple or neutral geometric patterns (as shown to the left). Something about this trend reminds me of the coast. And like all things ocean related we tend to bring them into our homes, probably due to our desire of wanting to be on a nice vacation consistently! The vertical paneling is a subtle detail drawing your eye to the height of a room or the choice of flooring. See here. Try a paneled ceiling or cabinetry, both of which will add an extra layer of interest. 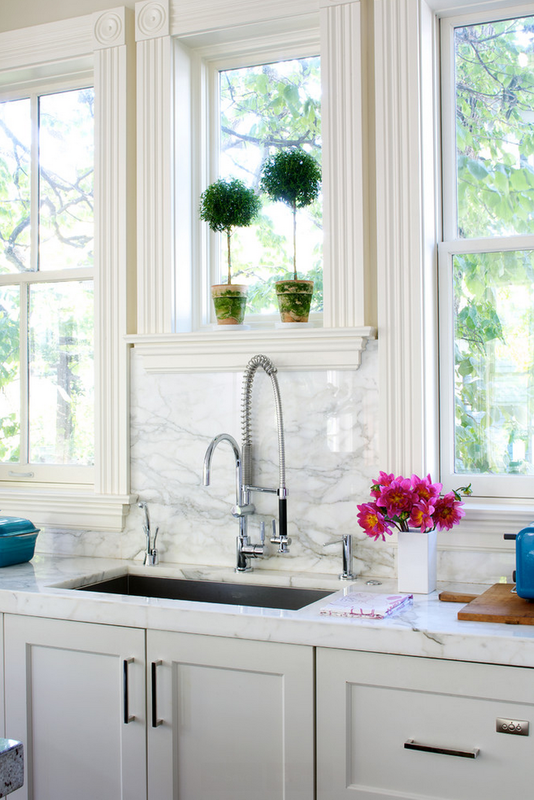 Classic Shaker-inspired kitchens never seem to go out of style. A lot of individuals love the traditional style and warmth of the Shaker style. Try focusing on the paneling of cupboard doors, which can work in a classic or contemporary space. Focus on clean lines and add a bright rug under the dining table for visual interest. Whatever you choose, be sure that you truly love it. Not just because your neighbor has something similar. Is it a color you love? Does it work with stains and smudges? How does the light-fixture shine when turned on? How can I add my personality into my kitchen? Be sure to ask all the simple questions when you go out shopping. And as always, happy remodeling! This week I stumbled upon a blog post talking about smart moves to make before you move into any home. One of those was to install shelves, cubbies and hooks for an organized closet. What a brilliant idea! While your clothes are still in the boxes take the time to remodel or redo one of the "rooms" of the house that is best when effectively straightened out and sound. Listed below are a few tips of how to DIY and/or what to know before you hire a professional closet organizer. It might not be easy, but tossing out or donating old clothes is key to making room in your closet. The truth is most of us have an ever-changing style or taste in clothing. So go through your closet and ask yourself if you’d buy this item today, or if it has a sentimental factor that warrants storage. Then lay it all out, and organize it by use, type or color. This will help you to get a grasp on what you wear and thus what you will need to find a way to store effectively in your new closet. Ask yourself, what would be ideal? What is the easiest way to access this item when I am getting ready? Next, you'll need to clear everything out of the closet so shelves, rods and more can be installed. Some of us hate digging through boxes (even if they're labeled), others don't like looking at open shelving, so think of what you want your closet to look like. Do you want it to resemble a traditional entertainment center (where most is hidden in cabinets and the show stopping pieces are on display)? Or maybe you want an open feel, all custom shelving, beautiful hardware, and beautiful boxes for a nice sleek look. 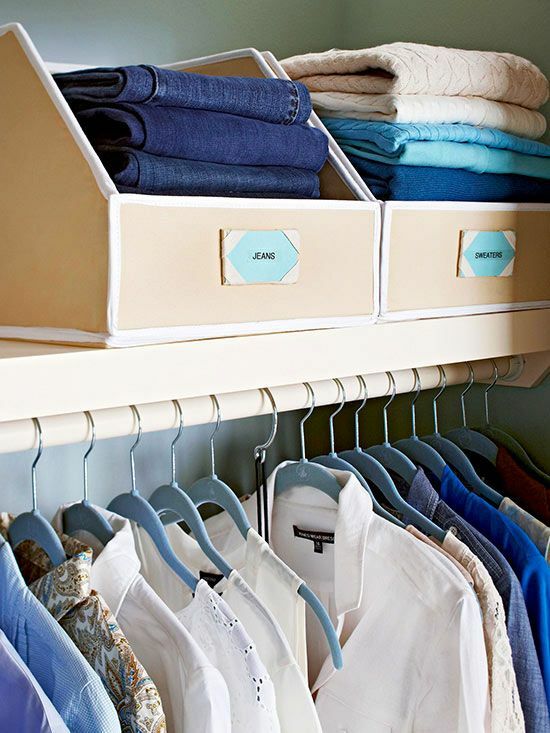 Try considering: peg boards (for belts, and scarves), custom small square drawers (for ties, nylons and watches), glass dividers (for a more open feel, but still accomplishing the separation you need), a built in ironing board (for quick fixes), and narrow alley rods (for scarves, jeans, and more). Need inspiration check out LA Closet Design, their gallery of different storage systems is wonderful! Don't have a closet or have such a small space for clothes theres no possible way it can support new shelves? Freestanding armoires are perfect for customizable storage space to take the place of a closet. Wire shelving or canvas storage can take the place of a narrow space. A tiered shelf stores shoes, accessories, or your delicate cashmere sweaters! Whether it's a bright table lamp or a massive chandelier, good and bright lighting makes a difference in a closet (even if it's a tiny closet). You base what you wear some days on color, seeing that color clearly is helpful, and if you have a mirror in your closet seeing how that color or outfit may look together on your skin will never appear more clearly than with bright lights. Finally design this closet based on how you get ready in the morning, or when you are in a rush. Build it effectively, sketch it out, and don't be afraid to call a professional closet organizer to get an estimate on what your dream closet may cost! Sofas are one of the biggest furniture investments you'll make — and one of the most permanent. Even if you're just buying one for a temporary fix, it'll eventually get demoted from the living room to the family room to the basement and, finally, the dorm. Before you know it, a decade or more has passed, and that impulse purchase has become part of your life. So give some thought to it before you buy. Quality furniture should feel solid and heavy. The same goes for a sofa. Flop around on one to test its sturdiness, then lift it up by the corner and shake it a bit. If it feels light or wobbly, take a pass. Look for a frame made from a kiln-dried hardwood such as oak, alder, birch, maple or, alternatively, high-quality hardwood plywood or marine plywood. Eight-way, hand-tied springs are a hallmark of fine furniture, but sinuous S-shaped springs can provide nearly as much comfort. Drop-in coil springs are a less costly alternative. 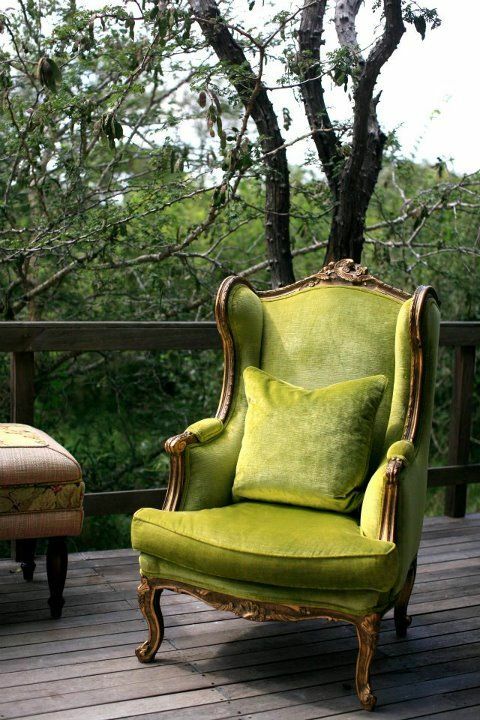 Most cushions have a core of polyurethane foam; the denser the foam, the heavier it is and the longer it will last. In the cheapest furniture, the cushion is filled with just the polyurethane foam core. In better furniture the core is wrapped with Dacron batting. Higher-quality options include poly-down cushions, which have down mixed with the batting; spring-down cushions, which feature a core of springs surrounded by foam and feathers; and all down, which is all feathers (and all work, so avoid this unless you have servants). The best sofas have joints that are double doweled and fitted with corner blocks that are both glued and screwed (not stapled) into place. Quality pieces have legs that are part of the frame, not just attached to it (although removable feet do make it easier to get items through doorways). But if you still need more convincing on purchasing a sofa for an extra $2-10k try this NYTimes article on for size. If your interior is traditional, look for a sofa with rolled arms, a contoured back, skirting, tufted cushions or arms. Contemporary and modern sofas tend to have cleaner lines, fewer flourishes and understated upholstery. Keep in mind with fewer tucks and bedazzles quality stuffing, stitching and even accent pillow choices is what will make this type of sofa shine. 1) Double Rub Count: The durability of a fabric is best defined by this count, which is tested by a machine that runs back and forth until the fabric is worn down. 30,000 double rubs is a great place to start for residential upholstery, while commercial projects generally require fabrics to be over 100,000 double rubs. 2) Repeat: If you are looking at anything other than a plain fabric you will want to pay attention here. The repeat is the distance that the entire pattern will run in the fabric before it repeats again. 3) Fade Resistance: This is rated on a scale 1-5, with 1 equaling a high level of fading and 5 with no fading. When it comes to fabric here is some advice: As a rule, synthetic fabrics are more durable, colorfast and cleanable. Tightly woven fabrics and fabrics that are heavy (such as true leather) will wear and tear better. 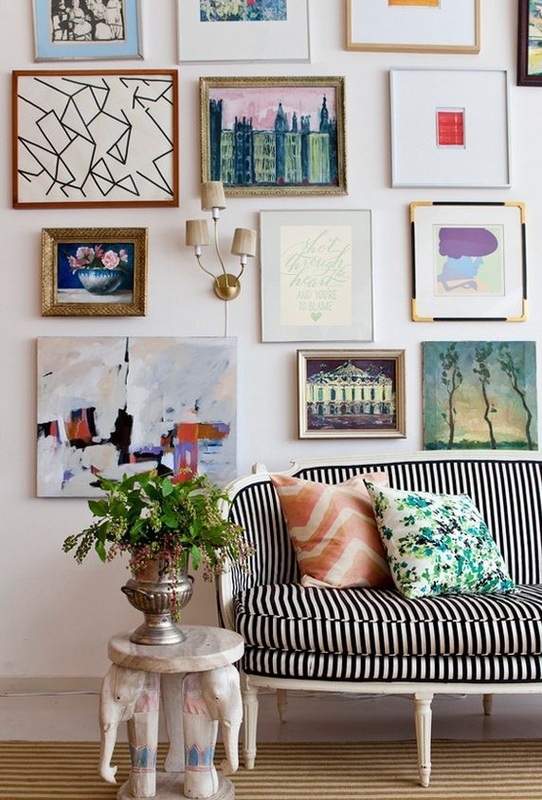 Avoid satins, brocades and damasks unless the sofa won't get much use. Whatever fabric you choose, ask the store for a sample or cutting that you can take home on approval before you buy. (If no sample is available, ask for a cushion) That way you can see the material under the light in your room and with other pieces of furniture. When you are spending a large amount of money the last thing you want is a surprise. No matter the season, many of us would love to have a larger bedroom. One that is filled with wonderful things, that is always clean and beautiful. Well, you can have that! The solution is remodeling your bedroom. Now wait! Don't be turned off to the idea of a remodel just yet. There are options! Essentially, a small bedroom remodel can be done in two ways, adding extra space (either by knocking out walls or playing on color and light) or changing completely the way the existing room is being used (space planning). Listed are a few helpful tips on achieving your stunning bedroom. Just because you have to choose small-scale furniture doesn't mean you're limited to pieces that are basic — or worse, safe. Instead, make a splash with a dramatic hue, a really luxe fabric, or both. A colorful and solid loveseat (see photo to the left) has minimalist lines and a scaled-down size that will work beautifully in a studio, but it's also a statement piece you'll want to keep when you upgrade to a bigger pad. Never underestimate the power of convertible furniture or hidden storage — both can work wonders in a small space. 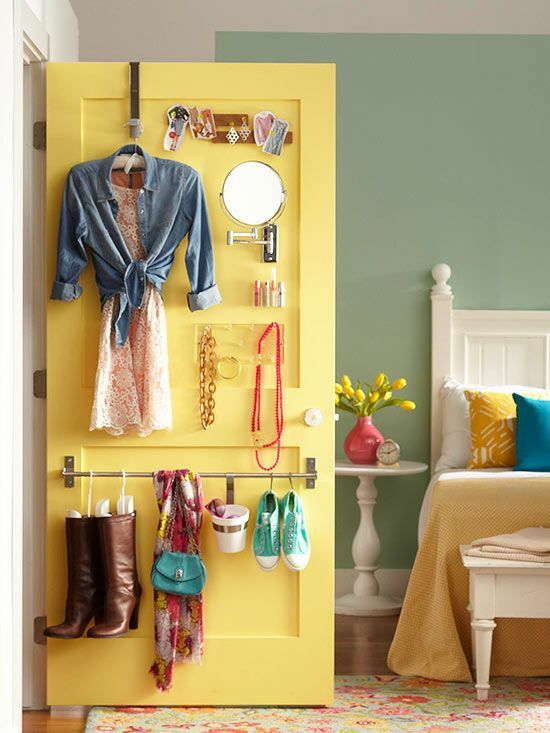 In this case (seen left), a closet door doubles as an entryway to clothing and a secrete storage tool with towel rods and hooks, made stylish by painted in a bright and friendly color. Try creating more secrete storage by purchasing an ottoman, that is hollow with a removable lid, or stylish drawers/baskets for under the bed to be used for blankets, seasonal clothing, shoes, etc. There are some benefits to living in a studio: You learn to buy less, manage clutter better, and revisit high-school geometry whenever you want to rearrange. The downside? You're living in one. Single. Room. Before you go stir crazy, let smart storage solutions divide the room for you. In this case, a DIY platform with pull out drawers creates plenty of bedroom storage you would normally need a linen closet for, with drapes separating the bedroom space your bedroom can become cozy or apart of your guests seating options, and finally a rug separates the space from sleep area to living area. If you want your space to seem larger, but you don't necessarily want to expand your room. You can replace your small window with a larger one, if you have the budget. Find a builder (not a carpenter) by asking around from other people, especially those who have had new homes built. Get estimates from at least three builders with specifics on materials to be used and probable time frame. Provided you know exactly what you would like, and you can afford it, your job should be relatively easy and quick because everything is at ground level. If you don't have the budget, don't stress! 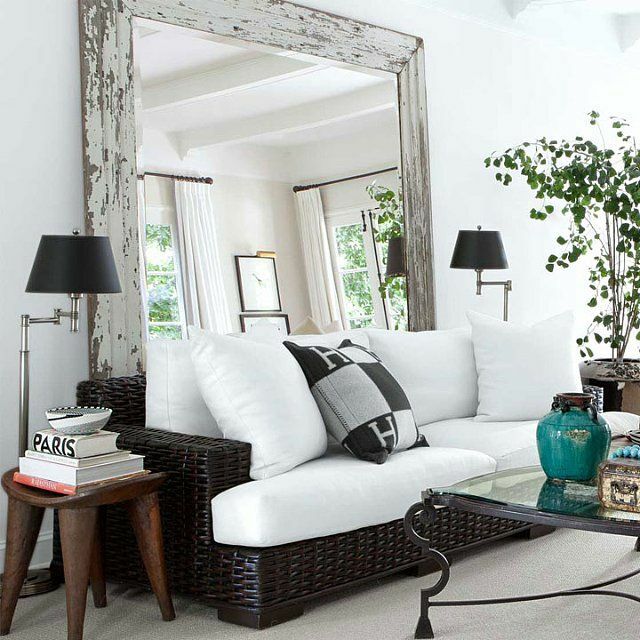 A large mirror positioned across from even the tiniest of windows can add dramatic space to a room. for a dramatic effect angle the mirror slightly rather than hang the massive piece.This will create light on your ceiling adding height and natural light in your small space. 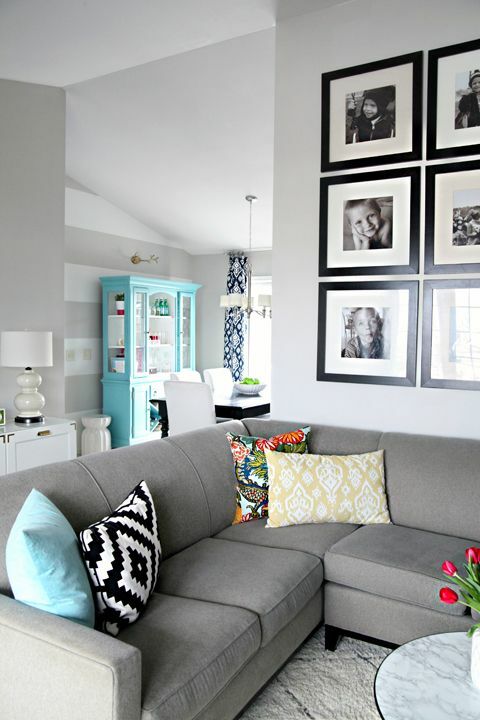 Or hang multiple small mirrors on a brightly colored wall for a wow effect. A tip is using light colored walls with a darker mirror frame and vise versa. Use darker objects at ground level with small bright objects displayed around the space. The picture displayed (to the left) allows your eye to rest in the white spaces, though your eye notices the dark shadows (space) and mirror reflection (unreal space) though this room is average size you feel as if you are in a mansion due to play on light, shadows and color. Whether you want to go bold and build out a nook for specific tasks (such as reading, a spare bed..etc) or if you want to just rearrange your space, ensure you know how you can maneuver around the room after changes have been made. Is there a clear path, or are you running into objects as soon as you walk in? Is there enough room to clean the space? Can I add to this space after I change it (such as placing nightstand, desks or lamps)? 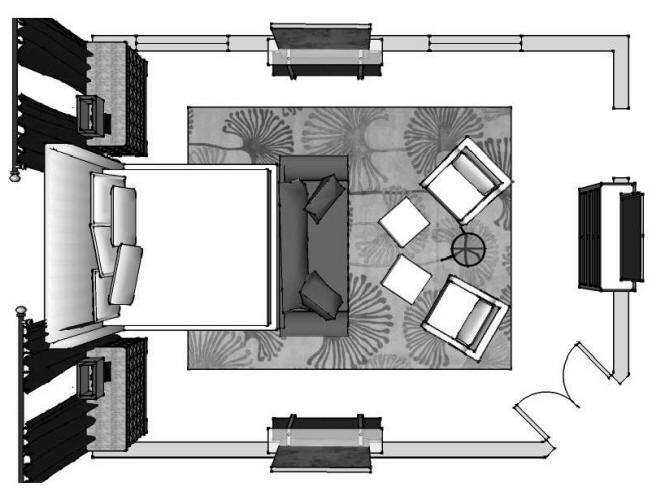 What has helped me when space planning a small room is removing all small furniture and easy to handle furniture OUT of the room, then drafting the space. How big does your space look empty? How can you maintain that look with furniture? Try two to three different layouts. Focus on your hobbies and how you use the space on a daily basis. However you decide to update your small bedroom, know what you want, know what you need, and always think of multiple options on how to obtain your stellar DIY remodeled bedroom. Decorating with string lights or lanterns is a great way to add soft light to the room and give a magically cozy feeling to your room year-round. Try hanging string lights on a mirror, or place lanterns on a hard tile or wood floor, or on your mantel (away from a child's' reach) to cast reflection off of your hard surfaces. For additional help check out modernize for ideas on getting the most style with light. Surrounding yourself with literature is simplest way to warm a home. Fill the shelves, coffee table or mantel with stunning travel and photography tomes, or your latest favorite. Try adding volumes of poetry on the nightstand in the guest bedroom, or turn that tiny study into a wall full of sturdy shelves supporting your book collection. Books create intimate, quite retreats, places to relax and they rejuvenate the home. Keep It Low. Keep It Simple. Don't always take decorating so seriously. The most comfortable homes feel inviting throughout because they feel like you and your family. A great design is brought forth from many different tricks, but the best one to follow is keep what you love and what has meaning, then find a room to store it in. A great way to make that room feel cozy is keeping it low - wether it's your couch or a mattress, sometimes loosing the frame of a traditional furniture piece invites child like playfulness and thus comfort. To keep that room forever trendy, choose a simple palette with pops of color with either a blanket, pillows or a beautiful piece of art. When it comes to color and sun the two are dependent on the other. 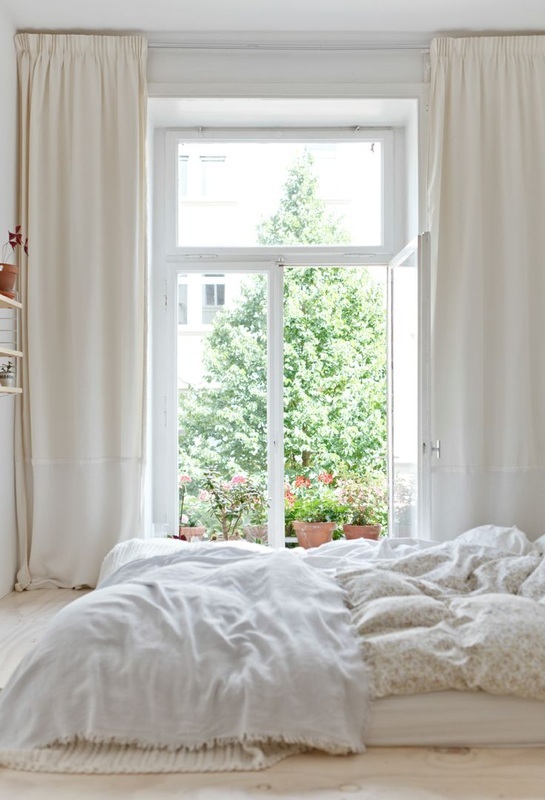 Consider the position of the room’s windows and the amount of light coming through. East, South and West-facing windows receive an intense amount of light at different times of day, while North-facing windows maintain a constant stream of milder light all day. Warm hues often help a room feel heavier and thus easier to relax in (think of a nice thick blanket); if you've chosen a wallpaper, draperies in a mattering pattern or hue close in the space to make it feel more cozy. Maybe it's the fact that when loved ones pass away we are accustom to acquiring their used stuff. But having furniture that comes with memories and history is often beautifully paired with modern or contemporary pieces. So beautifully that any space that can use old and new effectively the space is instantaneously made comfortable and warm. One of the fastest routes to a boring room is sticking to a single style or period. The most livable and inspiring rooms combine old and new pieces in a variety of styles to give them an effortless sense of having been assembled over time. An easy way to mix old and new is to consider a room’s architecture. If you live in a 1930s house, you can incorporate some period pieces, and then add contemporary lighting, rugs, or accessories to bring the rooms into the 21st century. If you live in a brand new high-rise apartment, choose a Persian rug, an antique mirror, or a vintage chandelier to create a sense of history and warmth. But if, like many people, you live in a cookie-cutter space, mixing vintage and contemporary pieces will give your home personality and dimension. Stick to a neutral color scheme and your flea market finds will blend right in with your IKEA staples, creating texture and subtle contrasts. Finally the key to any cozy space is making your space feel welcome and keeping your space legitimately warm with a fire or freshly baked cookies for your guests is a sure way to please anyone that stays at your residence.